This adorable edition of God’s Word for girls features the easy-to-understand New Living Translation text with a soft-fur, bright-neon LOVE design and silver glittery lining. The BOLD FAITH design on the back cover encourages girls to live out their faith in ways that bring God glory. 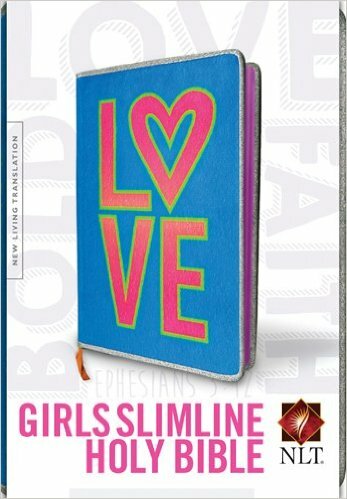 The Girls Slimline Bible NLT (New Living Translation) from Tyndale House Publishers is exactly what the title says. Its a slimline Bible which means thin pages but what this slimline Bible has that many slimline Bibles do not is a reference section including 53 page dictionary/concordance and 8 pages of full color maps. The cover is amazing. The cover is hardbound wrapped with fuzzy fabric printed the word “LOVE” and a hard glittery edge. On the back cover there is a cross with the words “Bold Faith.” The cover feels more durable than any other hardbound Bible that I own. Although the pages are thin, I would feel comfortable giving an early elementary school age girl this Bible and not needing to worry about the condition of the book. The purple page edging compliments the girl touch. Inside the cover is hotpink page with a cross outline and the scripture “Because of Christ and our faith in Him, we can now come boldly and confidently into God’s presence. Ephesians 3:12” Also inside the cover is a page for dedication including name, from, date, note. I really like how this book looks when it is open. 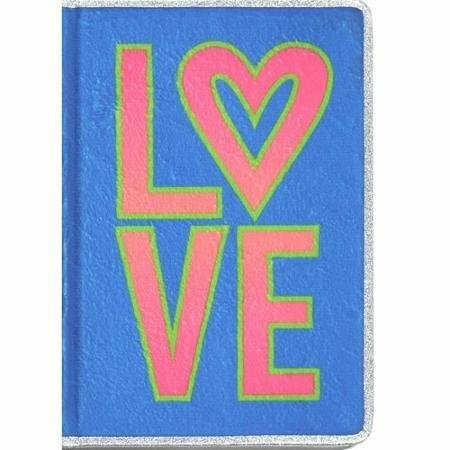 The purple page edging against the hot pink inside cover and glittery edge beautifully shouts “GIRL.” I would not hesitate to buy this Bible for my daughter or buy it as a gift for a girl of any age who needs a durable Bible. The Guys Slimline Bible blue chevron edition is the perfect gift for all occasions and features the easy to understand New Living Translation text. The 53-page dictionary/concordance helps kids locate passages on various topics. Includes 8 pages of full-color maps, a blue ribbon marker, and a special presentation page. 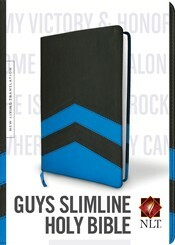 The Guys Slimline Bible NLT (New Living Translation) from Tyndale House Publishers is exactly what the title says. Its a slimline Bible which means thin pages but what this slimline Bible has that many slimline Bibles do not is a reference section including 53 page dictionary/concordance and 8 pages of full color maps. The cover is amazing. The cover is leatherlike and vinyl sewn together in a chevron shape. The silver edged pages go well with the blue and black cover. The matching blue ribbon bookmark is an added bonus. Inside the cover is the scripture “My victory and honor come from God Alone. He is my refuge, a rock where no enemy can reach me. Psalm 62:7” and a page for dedication including name, from, date, note. The Guys Slimline Bible NLT from Tyndale House Publishers looks quite durable. I would recommend this Bible to anyone who likes the color theme and is looking for a durable NLT slimeline reference Bible. Zondervan is known for its excellent resources in biblical languages, and many of our resources encourage professors, students, and pastors to continue to use their Hebrew and Greek Bibles beyond their seminary years. Devotions on the Hebrew Bible continues on this path of excellence by introducing these devotions—based on a careful reading and study of the Hebrew Bible—written by some of the top biblical language scholars of today. Contributors include Daniel I. Block, Mark J. Boda, Hélène Dallaire, Nancy Erickson, Karen H. Jobes, Bo H. Lim, Tremper Longman III, Miles V. Van Pelt, and Bruce K. Waltke, among others. Devotions on the Hebrew Bible contains a devotion on every book in the Hebrew Bible and can be used as weekly devotional or as a supplemental resource throughout a semester or sequence of courses. The main point each devotion offers comes from a careful reading of the passage in the Hebrew Bible, not from the English Bible. The authors use a variety of exegetical approaches in their devotions: grammatical, lexical, rhetorical, sociohistorical, linguistic, etc. Each devotion closes with a practical application. I can not say enough about how valuable of a reference this book is. 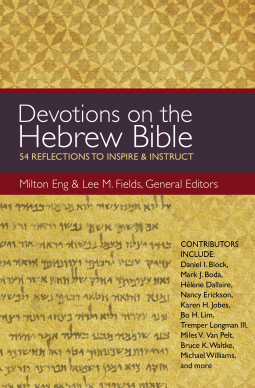 Devotions on the Hebrew Bible by Milton Eng and Lee M. Fields takes the love for the Hebrew language and brings it to a level that anyone who is studying the Hebrew Bible can relate to. The devotions are packed full of knowledge and information. I am amazed at how much I learned from reading this book. I am not one to get much from devotions. Anyone who is interested in Hebrew will learn from Devotions on the Hebrew Bible by Milton Eng and Lee M. Fields. I highly recommend this book to anyone interested in the Bible. This book will inspire you to dive deeper into the Hebrew language and how it applies to the word of God like never before. Based on the hit movie, join the girls as they get settled into Canterlot High. Plus, Sunset Shimmer tries to find the true meaning of the holidays as rumors circulate around the school. Collects the 2013 Annual and the 2014 Holiday Special. I was excited to review My Little Pony: Equestria Girls by by Ted Anderson, Katie Cook because my girls are really into My Little Pony. We loved the comic book form. The drawings and color is excellent. Even in the series they change the color and drawings so I cant complain about that too much. It was a bit little too long of a story for my little girls attention span. I’m sure we will read it again in a year or two when their attention spans are longer. All in all I was very happy with the book. 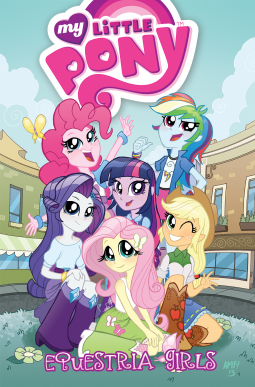 I would recommend My Little Pony: Equestria Girls by by Ted Anderson, Katie Cook to anyone who loves my little ponies. The Biblical Hebrew Companion for Bible Software Users helps users understand the exegetical significance of Hebrew grammatical terminology identified by the program. 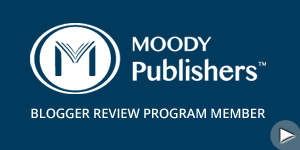 This resource provides students who utilize biblical language software the insight they need to make sense of the data provided by the program, giving them deeper insight into the biblical text that they could not get by solely reading an English translation. 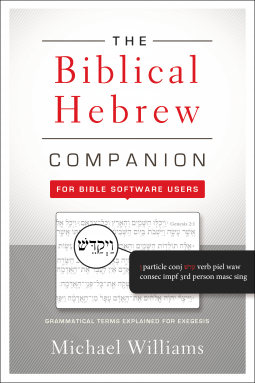 The Biblical Hebrew Companion for Bible Software Users is ideally suited for those who have never found the opportunity to learn the paradigms, vocabulary, grammar, and syntax of biblical Hebrew; pastors and other ministry leaders who may have learned biblical Hebrew at one time but have experienced the loss of much of that learning; and college and seminary students who have learned grammatical paradigms and vocabulary lists but have not had the tools to better understand and apply the significance of that data. The Biblical Hebrew Companion for Bible Software Users by Michael Williams is a valuable reference to anyone who is studying Hebrew. I don’t understand Hebrew much but I am beyond amazed at how much of a reference this book is for people who are studying Biblical Hebrew. This book is a deep study of Hebrew grammar and it gives me a desire to learn Hebrew. I highly recommend this book for anyone studying Hebrew. There’s something strange in the neighborhood… and whether that neighborhood is in New York City or Venice, Italy, the Ghostbusters will be there! After a bust at the United Nations, the boys in gray are engaged to investigate an Old World haunting, where they begin to unravel a mystery that sends them around the globe (while still trying to keep their contract with the City, County, and State of New York!). 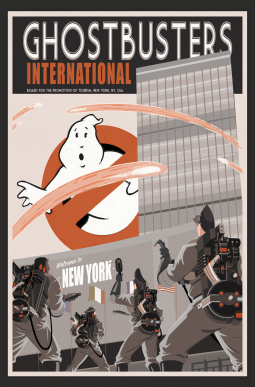 I decided to review Ghostbusters International by Erik Burnham because my older children and I really like the original Ghostbusters. This book unfortunately is nothing like the original. The book begins with a tarot card reading and death. This beginning turned me off to the book and gave me no desire to read further. As I read the book I noticed that it was stretching the story line of Ghostbusters and is not fun at all like the original. I was hoping to be able to allow my children to read this comic but with tarot cards involved, it is a book we they will stay away from. I would not recommend this comic book to anyone. Features include: •Over 500 questions and answers for kids •Book introductions help explain what each book of the Bible is about •A dictionary and subject guide help kids find what they’re looking for •Fresh, colorful design makes the Bible fun to look at and use •The complete NIrV translation, the steppingstone to the NIV! I was excited to review NIrV, Kids’ Quest Study Bible, Hardcover Answers to over 500 Questions about the Bible by Zondervan because I own the NIV Quest Study Bible and I was hoping for a similar product. Quite honestly the NIrV, Kids’ Quest Study Bible, Hardcover Answers to over 500 Questions about the Bible by Zondervan is the best NIrV that I have seen. My words can not describe how much I love this Bible. The font size and color scheme are perfect. The “Kid’s Question” sections are amusing and informative. My children and I sqent quite some time enjoying all the “Kid’s Question” sections. The NIrV, Kids’ Quest Study Bible, Hardcover Answers to over 500 Questions about the Bible by Zondervan also has a small dictionary. 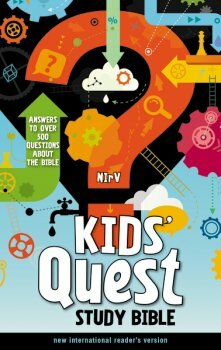 The next NIrV purchase that I make will be the NIrV, Kids’ Quest Study Bible, Hardcover Answers to over 500 Questions about the Bible by Zondervan.